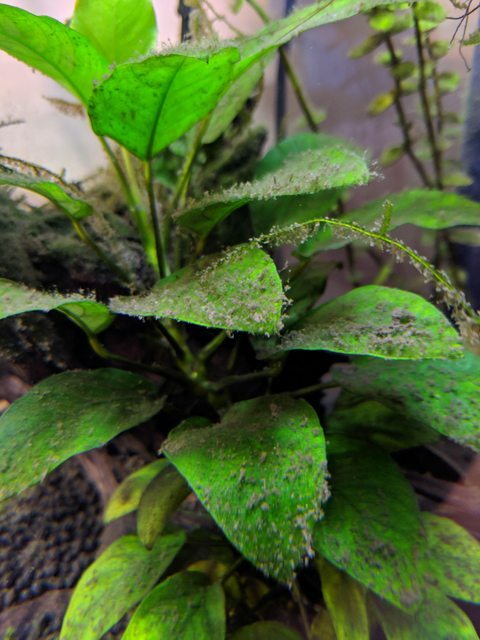 The Planted Tank Forum > Specific Aspects of a Planted Tank > Algae > Is this BBA? Hi there - I'm trying to identify the algae outbreak I currently have in one of my smaller tanks. I think it's BBA but when looking at other pictures I can't decide for sure. This is a very low tech tank with no CO2 or liquid ferts. I had a few spots here and there before but now everything is pretty much covered. Weekly water changes @ 50% with RO/DI water. Substrate is Fluval Shrimp Stratum. Once I know what I'm dealing with I can do more research on correcting. I suspect my parameters on nutrients are out of whack as I've never fertilized beyond root tabs for the stem plants. This has worked for 4+ years but now I'm getting this outbreak. Thanks for the help! The stuff on the body of the leaf almost looks like particulate matter built up on the leaf. What's your filtration look like? I see stuff like this on leaves that are in stagnant water areas. If it brushes off easily, I'd be inclined to say that flow is an issue for your tank. Good point - flow is very low in this tank as I just have a single internal filter. It does knock off pretty easily (the particulates) so maybe it is just too low flow / filtration catching up with me. I'll see what I can do. Thanks! Looks like you need to do a major vacuum and soon. Quick update - I do think this was a form of algae. I was able to knock off some of this during the weekly water change but some "held on" with the vacuum and even a light rub of the finger. Given the tank gets a vacuum every week I wouldn't think it was just particulate matter. Anyhow, I have since added some Amano shrimp and they seem to be chowing down on whatever it is. More flow in the tank seems to be helping as well. Thanks for the input!